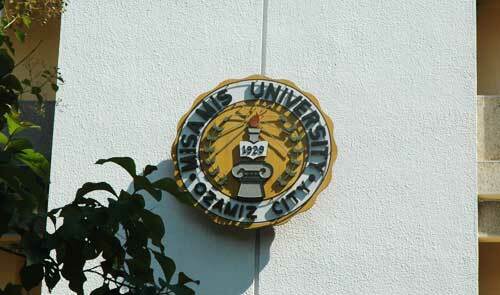 The Seal symbolizes the vision mission of the University in the development of a total man. The year 1929 represents the year the institution was founded and started to give education to the youth. The BOOK represents the knowledge imparted to the students. The LAURELS symbolizes the honor and success of the institution in rendering good services in the field of education. The TORCH represents the high degree of excellence that students should aim. It symbolizes the members of the family, staff, administration and the Board of Trustees for their undying support in guiding the students to the right way in attaining the goals and dreams. The GEAR surrounding the seal is the movement and development of the school towards the goal of proper education and prosperity to life. The GOLDEN YELLOW and WHITE COLOR represent the university color which symbolizes innocence, purity, reverence and humility. The Misamis University recognizes that the individual who is deeply committed to development and progress keeps honesty as constant principle in building a world of peace a plenty, a world of less expenditure and a greater splendor. MU inculates the awareness of what is right and appropriate in one's role, one's behavior and ones's relationship; a clean conscience "before myself and before my fellow human beings." MU believes that honesty is the founddation of everything else we do, the unavoidable first step toward change, growth, accountability, healing, trust and love. Misamis University develops in the individual a character that is marked with the desirable combination of emotional intellectual, physical, spiritual and moral qualities that distinguishes an individual. A person with integrity aims for excellence in the pursuit of his aspirations, conscious of his responsibilities to others and has a high moral values and work ethics. He is responsive to the scientific and technological changes in order to advance growth and development. The Institution believes in the principles that one's loyalty is the best manifested in the faithful adherence to a person, institution, government, cause or duty. It is an expression of the further institutional interests. MU strives to develop a sense of belongingness and to remain committed to the ideals of the University. It is the building of the intellectual, moral, personal and social virtues of the individual in all that he strives to attain. Misamis University places top priority in achieving the highest quality of scholarship in our academic endeavors. It takes a stand that allows for performance that brings out the best in individual. MU puts premium in the competence and professionalism of its faculty and staff and strives to develop competence and skills among the students so that they can help in the growth and development of the nation.